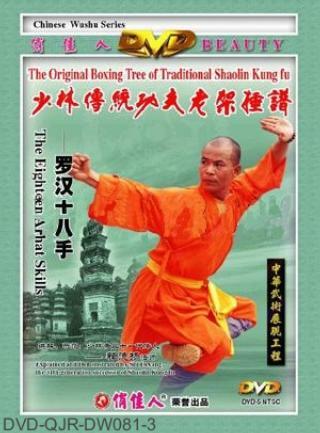 The Shaolin Arhat 18-hand (Shaolin Luohan Shiba Shou) is one of the elementary routines created in the earlier days. According to the record of Shaolin wushu history, this was dated back to the Sui Dynasty (AD 580-618) that the wushu monks created an exercise composed of simple and non vigorous movements for the monks who sit in meditation facing the wall for long period of time. At first, they selected one movement respectively from the eighteen bronze arhat statues, and it was called The Hands of the Eighteen Arhats. Later, it was evolved into a complete wushu routine, and it was also called Arhat 18-hand. The defense movements are mainly retreating, turning, dodging and shrinking in order to evade the opponent's attacks and in the same time, skillfully and rationally utilizing the strategies of attack upper and defend lower, attack left and defend right, true or false attack and defense simultaneously or alternately so as to achieve attacking without exposure of shortcomings, defending to look for counter attack opportunities, not be beaten when facing strong opponent and winning weak components for sure. Coordination of leg, elbow and body is also of concern, especially the eyesight must follow the hands and the advance of every movement. You use your eyes to determine the correct movements to use and the strategy to follow.